Edited by Karen Marta, Gabriela Rangel, and Lucía Sanromán, Erick Meyenberg: The wheel bears no resemblance to a leg is a fully illustrated publication released to accompany the solo exhibition of Mexican artist Erick Meyenberg (b. 1980) at Yerba Buena Center for the Arts in San Francisco (October 14, 2016–February 19, 2017) and at Americas Society in New York (May 4–July 29, 2017). Erick Meyenberg works at the intersection of drawing, collage, video, data analysis, and sound. 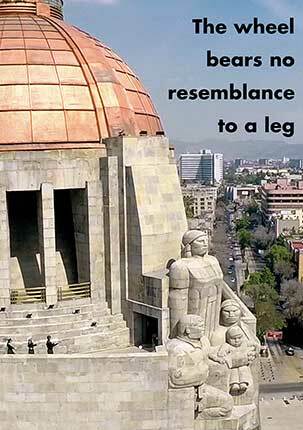 La rueda no se parece a una pierna (The wheel bears no resemblance to a leg, 2016) is the end result of a long collaboration with members of the high school marching band Banda de Guerra Lobos at the Colegio Hispano Americano in Mexico City. Meyenberg and the teenagers—together with curators, guest musicians, composers, choreographers, costume designers, and a video production team—cocreated the choreography and concomitant performances that took the band through some of Mexico City’s most emblematic and politically marked sites: the Plaza de las Tres Culturas in Tlatelolco, where a massacre of protesting university students took place in 1968; the Monument to the Revolution, commemorating the Mexican Revolution of 1910; and the shopping center Centro Comercial Forum Buenavista, symbolizing Mexico’s embeddedness in transnational post-industrial capitalism. Lavishly illustrated, and with essays and an interview with the artist, the book provides an in-depth introduction to the work of one of Mexico’s major emerging contemporary artists. Learn more about the exhibition Erick Meyenberg: The wheel bears no resemblance to a leg and watch a video with the artist and curator.